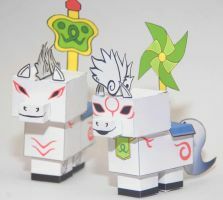 This cube craft paper toy is Kazegami, the Celestial Brush God of the Celestial brush technique Galestorm, based on the action-adventure video game Okamiden of Okami series, the papercraft created by scarykurt. Kazegami is a horse with a battle fan on his back, and his constellation is found at the top floor of the Gale Shrine. He represents the horse in the East Asia zodiac.